The Workforce Development Council of Seattle-King County is devoted to creating sustainable career pathways aligned within our Focus and Watch Sectors. Health Workforce for the Future (HWF) provides an exciting opportunity for individuals to find not just a job, but build a career within the healthcare sector. HWF is a local project of the Health Professions Opportunity Grant (HPOG) initiative of the U.S. Department of Health and Human Services. Below we’ve highlighted the story of Josselin Maceda, who seized the opportunities available to her to join a healthcare cohort for young people in college and complete her nursing assistant training. 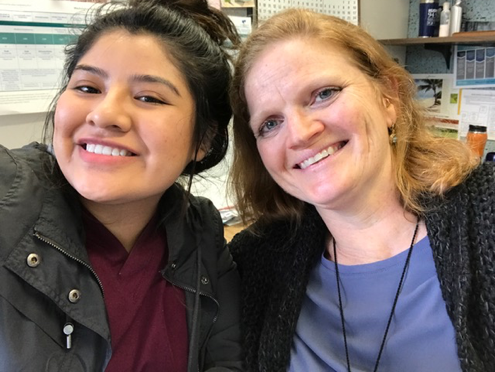 In late spring 2016, at the end of her senior year, Josselin heard about the Health Workforce for the Future (HWF) program from her high school counselor, as part of a recruiting effort for a special cohort—Health Exploration for Youth (HEY)—at Highline College in King County, Washington. The cohort was designed to provide hands-on healthcare career exploration, basic academic skills development, and an orientation to college. Students learn about opportunities in the healthcare field, explore occupations to find a personal fit, and develop the necessary skills to succeed in occupational skills training. Josselin enrolled in HEY in July 2016 and successfully completed the program in mid-August. She continued to work with her HWF Navigator into the fall quarter, when she began pre-requisite coursework required for nursing. In early 2017, Josselin enrolled in nursing assistant (NAC) training to fulfill a required nursing pre-requisite and earn a credential that will provide her access to higher wages and additional employment experience. She completed the training in March, and then turned her attention to employment and additional training. The Workforce Development Council of Seattle-King County (WDC) announces a $9.4 Million Five Year Award– The WDC is thrilled to announce a $9.4 million five-year award from the U.S. Department of Health and Human Services Health Profession Opportunity Grant for the WDC’s Health Workforce for the Future (HWF) project. The mission of the WDC is to support a strong economy and the ability of each person to achieve self-sufficiency. Under the direction of the WDC, HWF will help to build the healthcare workforce needed as healthcare workers near retirement age and King County’s population becomes increasingly more diverse. Leveraging the strong partnerships with Washington State Employment Security Department, Department of Social and Health Services, regional healthcare employers, local colleges, housing authorities, and community partners, HWF is poised to transform King County’s healthcare system. Using system-changing lessons learned from the WDC’s Health Careers for All five-year project, HWF will leverage, redesign, and enhance existing training program strategies. This project will target outreach to (1) individuals who remain unemployed, or have tenuous connections to the workforce, despite the improving regional economy. In order to ensure true momentum on a career path is possible, this project will also focus on (2) incumbent workers in need of support for wage and career progression. Finally, the project will target (3) low-income youth who are critical to the future workforce but remain even more disconnected from the labor force. Industry partners report that the push of healthcare reform toward a more prevention-oriented focus, changes in the economic model of healthcare, and demographic shifts in the patient population put new demands on the health workforce. Accordingly, local employers have emerging priorities around increasing workforce diversity, and expect growth beyond what labor market data alone might predict in many areas. HWF is designed to respond to these needs with an emphasis on occupational pathways and an explicit focus on engaging a diverse customer population. “Health Workforce for the Future is a fantastic opportunity to offer TANF jobseekers access to health care careers in King County, and we are thrilled to be a part of this project,” says Melanie d’Almada Remedios, Region 2 WorkFirst Coordinator at the Washington State Department of Social and Health Services.